Last February, Apple's market cap of $470 billion made it the most valuable company in the world, ahead of the former leader, international oil and gas firm ExxonMobil. And Apple kept going. By August, the stock was worth $621 billion making Apple the most valuable company of all-time and giving it a value 53% higher than the New York based runner-up. Apple even rose higher before peaking on the day that the Apple iPhone 5 launched. But a decline of 38% since then has taken Apple's market cap below Exxon's allowing the latter to regain the top spot as the world's most valuable company. Exxon now has a market cap of $418.23 billion versus Apple's $413.06 billion. The company seems to have lost the backing of Wall Street and main street. During its run up to all time highs, both good news and bad news were equally rewarded. Now, good news and bad news are equally met with selling. While Apple CEO Tim Cook might say that the product pipeline is "chock full," the cycle that Apple is currently in cannot easily be broken. About a half dozen U.S. companies in history have hit the $500 billion value mark including Apple, Microsoft and Exxon. Only Apple and Microsoft have ever hit $600 billion. In other Apple news the company has started pushing out iOS 6.1 beta 5 to registered developers. The update will allow Siri to buy movie tickets, and should improve Apple Maps, Passbook and a fix a few bugs. Beta 4 expires on Tuesday, so registered developers need to update to beta 5 ASAP! This my friend is the end of the forbidden fruit....!!!! This is only the calm before the storm when the next iPhone comes out. No I am not. Everyone keeps posting doom and gloom for apple. This happens every time before they announce the next iPhone. You mean the 5s, which will be the exact same iPhone with a slightly faster cpu and better camera? That'll be quite a storm, for sure. The stock dropping 40% does not happen every time a new iPhone is announced. Besides, one hasn't been announced. This isn't the end of Apple. 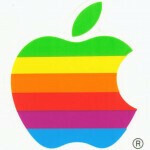 Its the end of Apple being able to cruise on its name. They will have to actually compete now if they want to survive. They've coasted on their logo for seven years now relying on lawsuits to keep the competition from blowing past them in innovation and sales. That didn't work 30 years ago in the desktop market, it didn't work the past two years in the smartphones market, and we're starting to see the same outcome in the tablet market. ""Before they anounce the new iphone"? This happened after the release of the iphone5 and ipad mini. Say what you want but statistics dont lie. My android wont bend when i sit on it on accident and it wont cost me 600+$ to buy a new one when mine gets stolen. Either way, nokia makes some pretty phones but alas I wont buy a WP8. So android will beat apple and apple will slowly corrode away to a lower stock. They wont initially be dead but they will not be back ontop like they were in the past few years. Their time is over, Androids is here, then possibly Linux / WP. All things end and its apples turn to crumble. It's only been 4 months though since the iPhone 5 came out. Usually this happens 2-3 months before the iPhone comes out, so are you saying that Apple is going to release another iPhone only 6-7 months after the previous one? That seems rather odd for them to do. 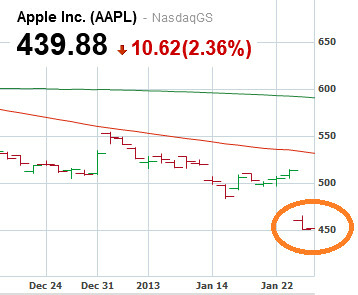 Or are you just pulling out an excuse to try and cover up that Apple is starting to nosedive? I mean, come on, even in the Asian countries where brand names are the biggest deal, Apple is starting to slip. Unless iOS 7 is some major overhaul, they'll continue to go down. Apple has been riding on the same plain old OS for 6 years. Time for them to do something new, or get out of the game. They're taking the same route RIM took. Then why did the iPhone 5's release do nothing for Apple's market share? When the iPhone 5 was released Apple's stocks continued to slide, a slight bump in November and then it slid to where it is today. Ya storm is waiting to come when Apple Inc would be declared bankrupt after filing official form no 10. I'm lost on how you think that was funny. I'm really so happy, and wish that it drops to 240 in next 4 to 6 weeks, GOD this bad fruit doesn't deserve to be cherished nor shall they have cults, hippys, and users praising this theif. I hope their value drops so far that they decide to remove themselves from the mobile market and go back to what they were doing before the world found out that apple is full of douches....go back to making your over priced computers! your TIME IS UP!! APPLE!!! not sure about that but if thats true... BOTH OF THEM DON'T DESERVE THE TITLE!! Don't deserve it??? It wasn't like the were voted into these positions, it simply is a matter of fact. yes lets make either google, samsung, microsoft, or subnoize records that most valuable company in history!